1. 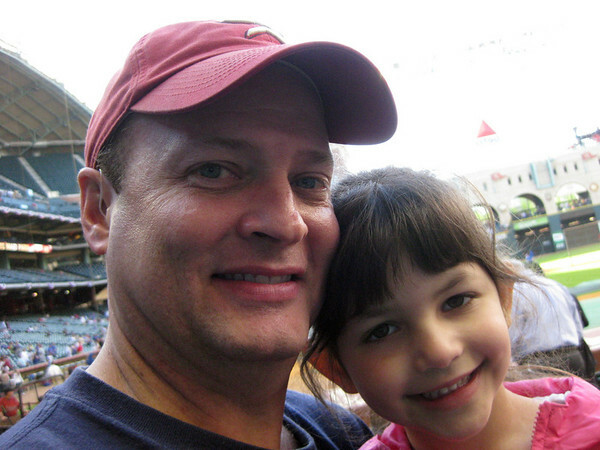 Tuesday evening Scott and Annelise went on a daddy/daughter date to the Astros game. I don't know who was more excited! A man at Scott's work sold the tickets to him, which were right behind the dugout along first base. In other words, rockin' cool seats complete with a parking pass. There were only 2 tickets though, so I gracefully sacrificed going so A. could go. Ahem. 2. The above scenario meant I had a WHOLE evening to MYSELF! What to do, what to do? There certainly were things I could or should do around the house, but I felt like escaping my corner of normal for a while, so I took myself to the movies. You bet your sweet bippy, I did. (What is a bippy anyway? I never really watched Laugh-In, but I think it was one of their catch phrases.) The show times worked out that I would be able to see not one, but TWO movies. Do I live large or what? Don't answer that. I have a fondness for quirky independent films, so I saw Sunshine Cleaning first. Eh, it was so-so. It could have been better, some parts were good, but it wasn't as sunshin-ey as I'd hoped. My plan was to also see the Julia Roberts/Clive Owen (um, hunk-il-icious) spy flick, Duplicity. While I was waiting in the theatre four older ladies made their way to their seats. They were so cute in their nylon jackets and supportive shoes, chatting about their water aerobics class earlier that day. One may or may not have had a fanny pack. Seeing them made me flash forward to my future, hopefully still going for girl's night outs with my friends, possibly with the perk of a Senior Citizen discount. I promise to skip the fanny pack though. Anyway. Somehow there was a mix-up and they switched the movie in the theater I, The Nylons, and a handful of others were waiting in, without telling us. After watching a seemingly endless stream of ads and semi-previews, and waiting fifteen extra minutes, we formed something of a brigade and went to see what was the dealio. This is when we learned Duplicity had been switched to #10 and Monsters vs. Aliens was about to start in #13, from whence we came. The badly suited (seriously, his poorly fitting suit needed help), silly headset wearing, teenaged manager tried to explain the dealio to one of The Nylons and another scarily tanned, slicked back hair sporting older man (think George Hamilton freaky). Mr. Hancock, the manager (seriously, Mr.??) escorted them back to #13. Even though Duplicity had already started in #10, I darted in there to see it anyway. I had missed the first 10-15 minutes, but don't think it mattered. I ended up liking the corporate espionage twists and turns, plus there was that whole Clive Owen thing. 3. Its official, Annelise is completely obsessed with braids now that she knows it's an option. What have I done? Every single day this week she has requested them, even though they make us a little late to school. Note to self: must adjust morning routine if this trend continues next week. I've decided that two braids are my favorite. 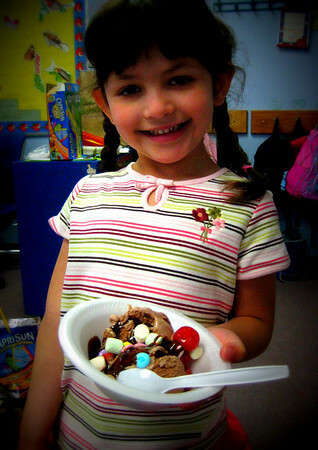 they also made their own ice cream sundae. Can you say sugar overload? After all the sugar consumption they hunted for Resurrection Eggs outside. Have you heard of those? Inside each egg is a small item relating to Jesus' betrayal, arrest, crucifixion and resurrection, like nails, gauze, silver money, dice, crown of thorns, etc. After finding the eggs, they took turns opening them and explaining what the items meant. I was impressed because they all did very well describing the items and retelling the story. 5. Since there was no school today for Good Friday, we had a highly enjoyable lazy dazy morning. 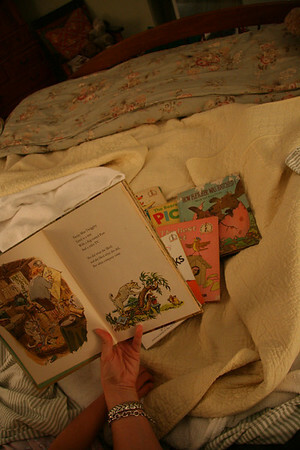 Annelise crawled up in bed with me with a stack of books and we read a few. Love that. Scott is playing golf this morning then we are meeting him at the boardwalk in Kemah to eat a late lunch and fritter away the afternoon. This weekend's forecast calls for egg hunts, egg decorating, friend and family time and of course, plenty of food. Do you find yourself somewhat perplexed trying to explain the whole egg dyeing/egg hunting/spring/Easter Bunny/candy/basket thing while still focusing on Jesus to your little people? Of course the two things aren't related, but it all seems to get jumbled together in this one holiday. Annelise hasn't really asked too many whys about the Easter Bunny and egg related activities we do, she just has fun and eats the candy. I guess that's all right. How Fletcher Was Hatched - one of my favoritest books from childhood. still have my well-worn "dog-eared" copy!! Lelly: Fletcher was one of my faves too--so I made sure to grab it this morning for our read-in. My copy is moth (or something) eaten, but still readable. I love, love, love sharing my childhood books with her, she thinks it's pretty neat too, even though they show wear, tear and age. Love the two braids! I am perplexed more than usual about Easter activities this year. So much candy and hoopla for a pretty serious holiday. 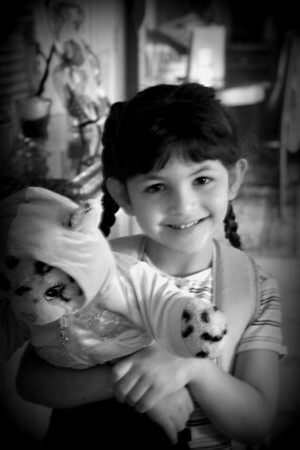 But kids don't really do like we adults do and slow down and reflect on the true meaning of Easter. We should be talking about the true meaning of Easter all year long, anyway. So all the fun is perfectly okay in my eyes. And my eyes love bright colored eggs especially when they have pieces of chocolate inside! Fun day for everyone! We've done egg hunts and baskets, but we've never done the Easter Bunny. I can tie Santa into Christmas with no qualms, but I will not try and make connections with a bunny. My kids know that it's just something fun we do, and that Easter is really about Jesus' resurrection. I have a cute book called, The Legend of the Easter Egg, which does a good job of explaining the whole thing. 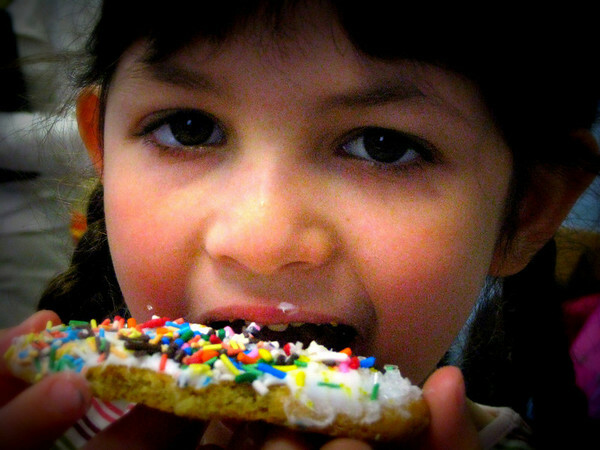 I love the picture of her with the cookie!--Those eyes!!! Love the braids. Luci does her own hair now in the morning except if she wants braids - must schedule extra time. What a rockin' daddy-daughter date! that first pict is reminiscent of a photo I have of my husband and daughter at opening day a few years ago!